Our Latest Acquisition is More Than Just an Object…. Museums exist not only to house objects for protection into the future, but also to tell the story of the object. Very often, objects can tell us of a general time period, or a cultural aspect. But, on rare occasions, an object comes along that not only tells a cultural story, but also the story of a place and of individuals. The Luther Bean Museum’s latest acquisition is just that special object. The Lopez weavings were donated by descendants of the weaver this spring. 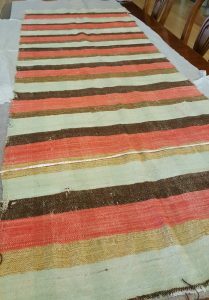 The two beautiful blankets were woven by the donor’s Great, Great Grandfather, Juan Jose Lopez sometime between 1880 and 1900. Juan Jose came to the San Luis Valley in 1857 and raised cattle and sheep near Los Pinos Colorado. According to family history, Juan Jose dyed wool from his own sheep and used it in his weavings. He is listed among those “Hispano Weavers in the San Luis Valley” in Marianne Stoller’s article “Spanish-Americans, Their Servants and Sheep: A Culture History of Weaving in Southern Colorado.” These particular blankets were given as a wedding gift in 1920 to the donor’s Grandparents, Alfonzo and Paublita Lopez. The weavings have remained in the Lopez family, who still dwell in the SLV. These beautiful blankets are not only tell of one families connection to the San Luis Valley, they also are representative of an important art in the Hispanic culture and history of the area. The spring semester at ASU is moving right along just as spring moves right along in the SLV! On March 11 a tour group of History Colorado members visited the San Luis Valley and spent a day with members of the Sangre de Cristo National Hertiage Area touring a few of the important cultural sites in the Valley as well as making a stop at the Luther Bean Museum. The Salazar Center director, Rio de la Vista, and myself, got to tag along on the tour! We were able to visit and get some history on the San Jose Church in Capulin and see the historic Garcia Ranch. The last stop at the museum gave visitors a chance to hear a brief history and overview of the Luther Bean and look around at the various objects. Additionally, I gave a brief presentation on the recent projectile point display. All in all it was a great chance for the Salazar Rio Grande del Norte Center to interact with the public and the Luther Bean Museum to showcase its collection to out of town visitors. 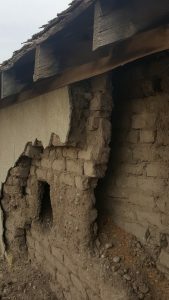 Below is a photo of the double wall construction of the potato cellar at the Garcia Ranch.